The AHTR blog hosted a discussion on online syllabi and–very much inspired by Smarthistory’s online syllabus offerings–created a template for an online syllabus for Prehistory to Gothic (here) and Renaissance to Modern (here). By online syllabi, we mean syllabi that thrive on hyperlinked resources that are used by students online, as opposed to a syllabus predominately predicated on paper or hard-copy resources. These online syllabi are formatted as a Google Doc Excel spreadsheet for easy editing. You can copy and paste this template to your own Google Doc in order to create a stand-alone syllabus that reflects your survey focus. Your link to the spreadsheet you create can be emailed to students at the beginning of the semester and/or posted to Blackboard. If the access is set to “anyone with this link can view,” then students can see the syllabus on Google Docs by accessing the link through Blackboard but won’t be able to add or delete. You may be required to teach from a particular textbook or to teach chronologically rather than thematically. Below are resources for several different types of syllabi that can be “mixed and matched” to suit your needs and teaching specialisms. 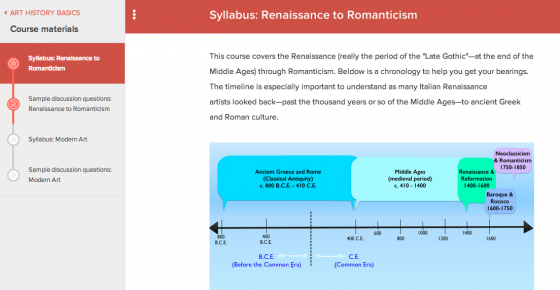 If you’re a Renaissance specialist, expand that part of the course. If you’re a non-Western specialist in African Art, flip the weekly chronology and begin with non-Western (and contract certain Western topics). Again, we recommend great resources like Smarthistory’s Art History Survey syllabi templates and discussion questions. 1) If you’re building your very first syllabus, you might find the syllabus checklist useful. 2) Here’s a template for the “outline and rules” section of your syllabus that can be used as the introduction to any course – it includes basics such as a course description, grading policies, classroom etiquette etc. 4) You may also want to take a look at “standards” like the AP College Board Art History syllabus that contains, amongst other helpful info, brief weekly descriptions and a good, broad course bibliography. This short and smart post by Louise Lamphere Beryl, PhD Candidate in Anthropology and Education at Teachers College, Columbia University, discusses one way to approach syllabus design—”Backward Design,” as touted by educators Grant Wiggins and Jay McTighe. 1) The Museum Response Paper template can be used as an assignment once or twice during the semester as a way to a) have your students undertake a concise written exercise that b) asks them to look closely at one object (or two, if you’d like them to compare and contrast) and c) also asks them to engage with the museum or gallery space to make them aware of the cultural context in which they encounter objects in institutions. This template can be “set up” in class using the museum visit videos and Museum Observation Prompts handout. 2) The “How To Write A Thesis” template is a useful handout for a class exercise post-museum visit, once students have picked their object and can think about what a thesis is and how to construct their own. As part of this in-class exercise, it might be useful to look at examples of previous students’ thesis statements on the Writing Examples PPT, which includes anonymous examples of past museum response paper excerpts, so students understand what a thesis statement, formal analysis paragraph, museum environment analysis, and concluding paragraph might look like (you can, of course, point out the merits and/or pitfalls of each example per your own teaching preferences). 3) The Grading Rubric and Paper Style Guide handouts can be given out in class and/or uploaded to your Blackboard and retooled to fit your objectives for the written assignment. 4) This Formal Analysis Assignment provides some great ideas on how to guide students through formal analysis reminding them that the exercise is about looking and analysis and not research and analysis. Students are often reluctant to trust their own eyes and their own opinions. For formal analysis papers, they often automatically go to an outside source in order to further bolster the assertions they make in their papers. Kimberly Overdevest at the Grand Rapids Community College in Grand Rapids, Michigan has had great success with these prompts. Asking your students to undertake a research paper as part of the art history survey can be a tricky beast as the range of student experience with elements such as library research and bibliographic citations can be large and crippling. For most mixed-ability or required-credit survey classes, focusing on short papers with limited research allows you and the students to focus on finessing writing skills first. Always consider reaching out to the Writing Center on your campus—a staff member can usually make an in-class visit to tell your students about the range of services on offer which should include workshops and one-to-one appointments. Grading student papers can be done the old fashioned way (your students hand you a paper copy) or through anti-plagiarism software such as SafeAssign (part of the Blackboard suite) or Turnitin.com (your school may have a license—find out who the Turnitin campus coordinator is for more details). There are ethical considerations to using anti-plagiarism software. Presentations—either singly or in groups—can be a good way to have your students think about a class theme from a new angle. See the handout “How to give a great oral presentation,” which also contains a sample grading rubric so students understand instructor expectations as they prepare. This resource offers adaptable rubrics created as part of the American Association of College and University’s Liberal Education and America’s Promise (LEAP) initiative. The “Syllabus Templates and Resources” page was last updated 4.18.2015. Ryan Hill: When I use to teach art history, I always felt the same way as you about the textbooks. It was great to read your article and see how things have changed for the better. Michelle Millar Fisher: Randall – v interesting idea and the logical next step. Want to expand in a blog post and take it from abstract provocation to concrete suggestion? Eg. How to negotiate class content with the class as the semester progresses? Having the students build their own either individually or as a group. Or any examples of this being done that I could post? I’m interested! I like the idea of having some set readings and having some decided upon by the students. Is this what students want though? Are parameters comforting? I’m especially interested in 1) how others have had students present/share this information (I’m planning on using a wordpress blog with links to google docs/student e-portfolios) just b/c I didn’t want to learn new technology this semester; 2) how do they evaluate student contributions (I’m using annotated bibliographies and asking students to maintain a research/reflection blog). I’m still finalizing lots of details, so if others have experiences/advice to share, I’d love to hear it…..soon! The readings/concept mapping sound amazing Virginia. Would you consider posting to AHTR at the end of the semester to sum up what you thought of your process and your & student experience? Evaluating student experience is an interesting question – I’m drawn back to the model you offered actually – the one on your audio guide assignment where students can self-asses, asses their peers who they worked with, and then a teacher assessment too – like a 360 review. But this is no way an area I have great practice in so I will look forward to nay other comments too. This is very interesting stuff. I now use a rubric that is extremely specific and I attach the rubric to the paper after I complete corrections (using track changes) so that the student can see precisely what was done well and where points were simply thrown away. (My assignments and style sheets are very detailed, so they theoretically know what I want.) Most students sort of ignore the rubric. But those who use it–before handing in the essay–and read through the results when they get the essay back–tell me that it is very helpful to them.